Entertainment store presents *Foamatina 2.0* #holireloaded organised by Cascabel Events. Come join us for The Surat’s best Holi Party featuring For the First time *”Phullo Ki Holi?”* - Skin Friendly Holi. 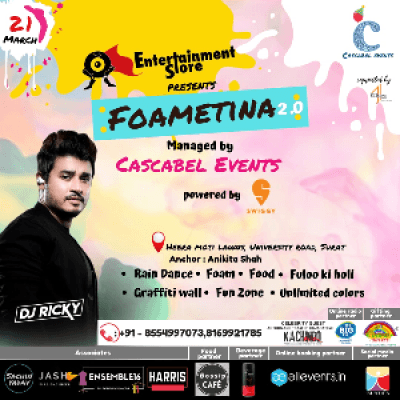 *Foamatina is back* reloade with a Unlimited Fun filled Day with Colors?, Rain Dance, Foam Party, Phullo Ki Holi? ,Food and beverages and Many more attractions such as Fun Zone, Graffiti walls and photobooth. •Discounted price for Couple passes. •Buy 5 passes and Get Rs 200 food coupon free. 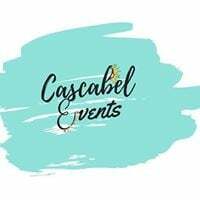 •Buy 10 passes and Get Rs 500 food coupon free. •Buy 15 passes and Get Rs 700 food coupon free. •Buy 20 passes and Get Rs 1000 food coupon free. 9:00 a.m. to 03:00 p.m.
Opp Vastu Luxuria, Udhana - Magdalla Rd, Piplod, Surat, Gujarat 395007.